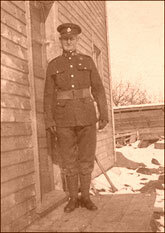 I have decided to include photos sent in by our readers of their relatives that served in the various wars fought by Prince Edward Islanders. If there get to be too many (photos are quite hard on web space), I may have to limit the time they are left on, but I thought this could be interesting to all! This photo from Saralee M. Caldwell, smcofwa@comcast.net - "These are a photo of Wellington and a photo of his grave stone in France. Wellington's older brother, Stephen Lawson Enman, my Grandfather, always spoke with pride of his younger brother. 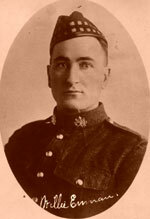 If possible, it would be very gratifying to see Welly's photo in the Island Register with the other Island Soldiers who served their Country." This photo from Bonnie MacDonald, bonnie_macdonald@sympatico.ca - "This is a photo of Givin MacDonald of Nine Mile Creek. 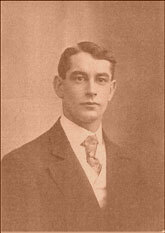 Givin was a member of the 105th Charlottetown. 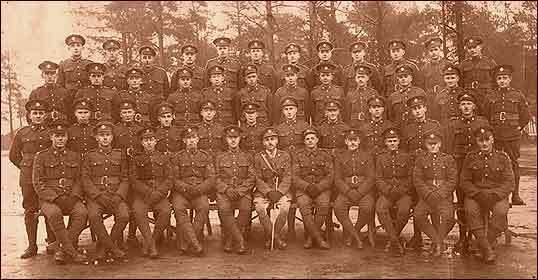 This photo was taken we believe the fall of 1915 before he went overseas." 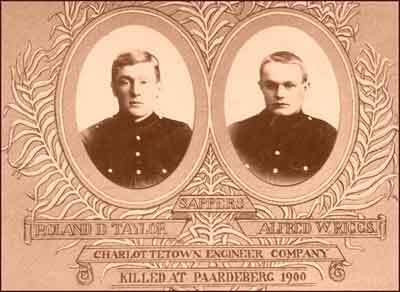 This photo from Dennis Taylor, rdpei_taylor@yahoo.ca - "Two Islanders who made the ultimate sacrifice in the Boer War. There is a monument beside Province House to their memory. Roland Dennis Taylor was my first cousin, twice removed." 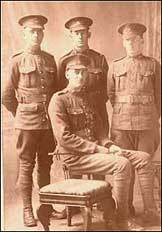 This photo from Dorothy (Gregory) Sullivan, Xysully@aol.com - "These men were serving in the 26th Btn Canadian Expeditionary Forces World War I. My father told me the other men were all from PEI." The picture is a post card (never mailed) and has this note on the back. "Dalis Villard is in this photo-- he is the brother of Bill Hanlan of New Zealand, PEI"" - Dorothy. [France?, c.a. 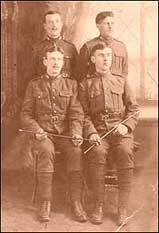 1916] Standing left: Alec MacDonald, Hopedale, Others (order unknown) Lorne Doyle, Alex Brennan, and Sinclair MacKenzie (Belfast). All other than Alec were listed as KIA during the War. This Photo from Bob MacDonald, Camalba@aol.com - His father was a member of the 104th. 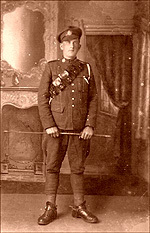 James "Jack" Lowe KIA WWI. 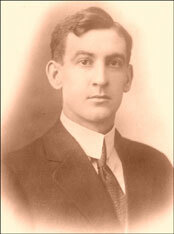 Louis died in Winnipeg, Weston in Charlottetown (buried in People's Prot. Cem. 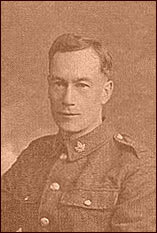 ), Don's grandfather Samuel in Edmonton, and Jack was killed in action July 26 1917 during WWI, buried Maroc British Cemetery, Grenay, France. This photo from Arlene Marshall - agm.1987@sympatico.ca . Arlene sends in this photo of a garrison of the P.E.I. Militia taken in 1907. Her grandfather, Ira Seymour Ross is in the photo, top row, fourth from the left. 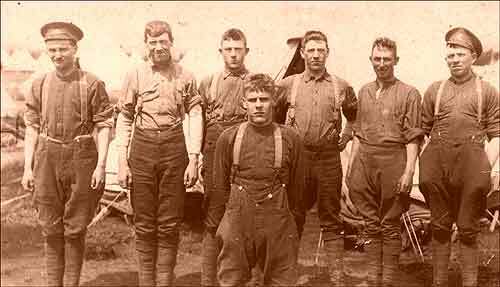 His brother, Kestle Bertram Ross is also in the photo, but we don't know which one he is... Now, if anyone can identify any of the men in the photo, please let Arlene and myself know - it would be wonderful if we could identify all the gentlemen in it! Let's have fun with this wonderful photo! The photographer may have been James A. S. Bayer, listed as working out of Great George St., and residing at 8 Euston St., in Charlottetown in the 1924/25 McAlpine's Directory. It is difficult to be certain - his logo is located below the portion shown, and is a pressed in watermark which has deteriorated with age. Anyone have more photos to post? If you do, send them along, and I will post them. If too many come in, they will be put on for a limited time, then eventually replaced with others... Contact Dave Hunter, dhunter@islandregister.com.